Union Public Service Commission invites applications for the posts of Translator(Sinhalese), Divisional Medical Officer of 33 vacancies on its official website upsc.gov.in. 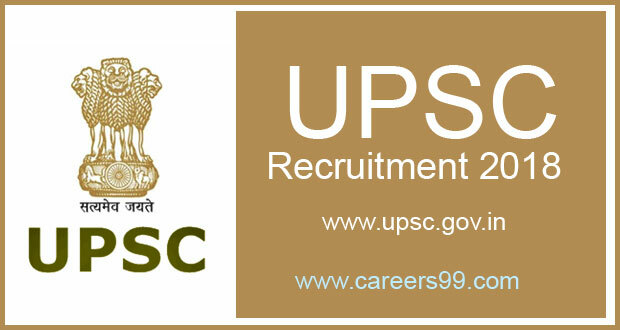 The details of UPSC Notification 2018 are available at www.careers99.com also. Interested and eligible candidates can Apply Online before last date of the Notification i.e., 01-03-2018. Education qualifications, age limit, selection process and other details are as follows.. Interested candidates those want to apply for UPSC Translator(Sinhalese), Divisional Medical Officer posts must having following educational qualifications. Translator (Sinhalese): Bachelor’s degree in the Foreign Language concerned (SINHALESE) with English as a compulsory or elective subject at degree level from a recognized University. Eligible and Interested Aspirants are requested to Download Application Form from Below link of upsc.gov.in Website and Submit it to the mentioned Address before Last Date i.e., 01-03-2018. First of all, Open Official Website i.e., upsc.gov.in or Below Mentioned link from www.careers99.com Website.